Every 21st century researcher needs to check the online record collections on a regular basis - you never know what you're going to find (says my distant cousin, Forrest Gump Seaver). I searched Ancestry.com over the weekend for my 2nd great-grandmother, Sarah (Knapp) Auble (born in New Jersey in 1818, spouse of David Auble (1817-1894, died in Terre Haute, Indiana), using her married surname. The last record I had for her was from the 1900 U.S. Census where she was enumerated in Bushnell, McDonough County, Illinois with three of her daughters. I have not known her death date, death place, or burial location for almost 30 years. 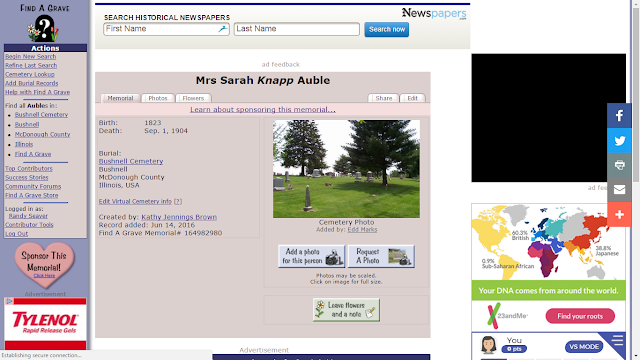 The record provides a death date of 1 September 1904 for Mrs. Sarah Knapp Auble, buried in Bushnell Cemetery, Bushnell, McDonough County, Illinois. There is no photograph of the gravestone on the Find A Grave memorial, so I requested one using the handy "Request a Photo" button on the image above. The Find A Grave memorial was uploaded on 14 June 2016 - thank you, Kathy Jennings Brown! It is unclear if this was obtained from the gravestone or from a cemetery record book of some sort. I will email Kathy if I can to find out. 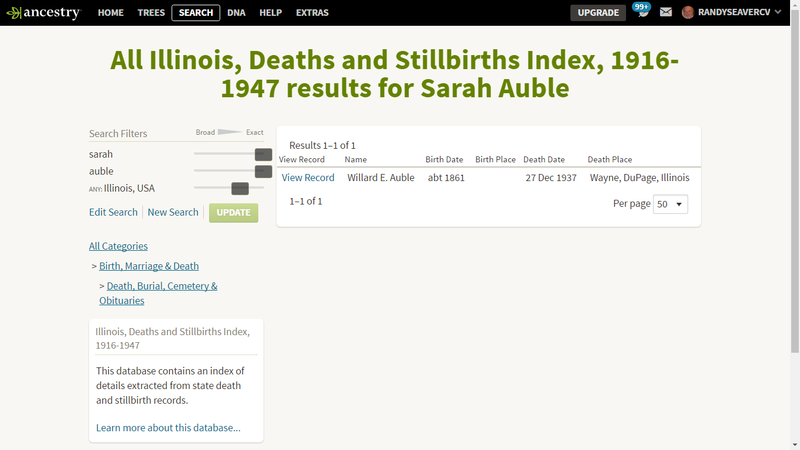 I searched for other records for Sarah Auble using wild cards and Illinois records and did not find a death record. Perhaps there isn't one, or perhaps the name was recorded poorly or was indexed poorly. 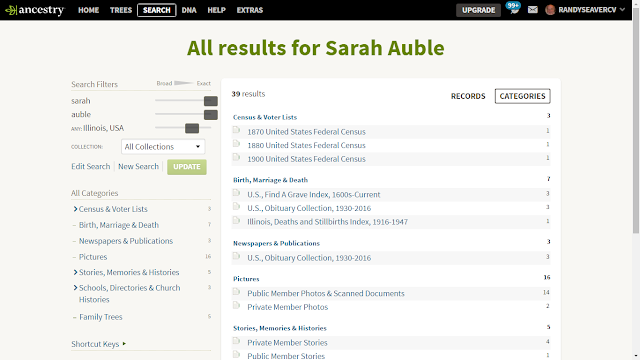 In the name of all of the blessed gods of search engines, how does an EXACT search for Sarah Auble produce Willard E. Auble? I'm scratching my head on this one. So now I have a death date and a burial location for all 16 of my 2nd great-grandparents. I'm glad she was found. 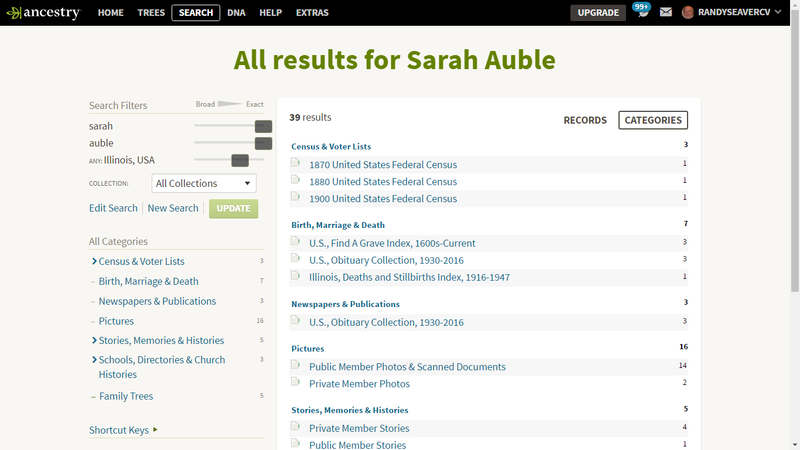 there's a probate file index showing file # 10185 for a Sarah G Auble in 1905, Anna A Buntin executor. 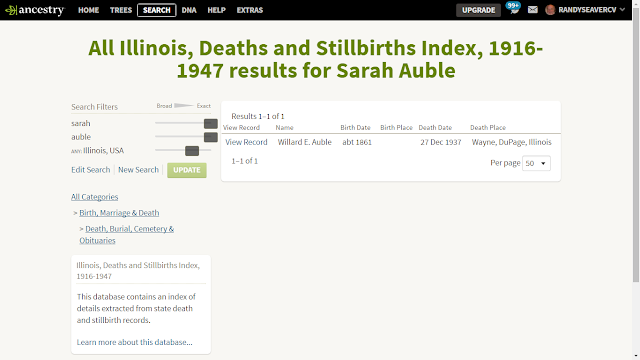 Unfortunately, that county's actual probate records don't seem to be included on Family Search or Ancestry, but it looks like the records can be ordered thru Western Illinois Univ. THANK YOU!!!! I'm sure it is the same Sarah Auble - one of her daughters was Anna Buntin. I will follow through and try to obtain it.